The large-scale military drill exercised Russia’s land, air, and sea-based nuclear capability with test launches from submarines, supersonic bombers, and a launch pad. “The goal of the launch was to test advanced ballistic missile warheads,” a Russian defence ministry spokesman said. And the missiles, as well as the warheads, were very advanced. Not only does the land-based missile boast a range of over 6,000 miles, enough to hit anywhere in the US with hundreds of kilotons of explosive force, but it has been tailor-made to evade US missile defences. 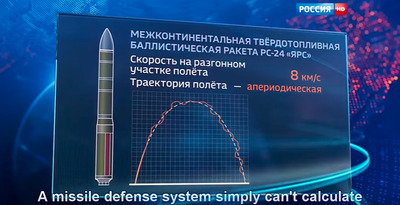 Russian media reports that the Yars ICBM tested by Russia flies in a jagged pattern to evade missile defences. Once the missile breaks up, it carries multiple reentry vehicles and countermeasures to confuse and overwhelm missile defences. 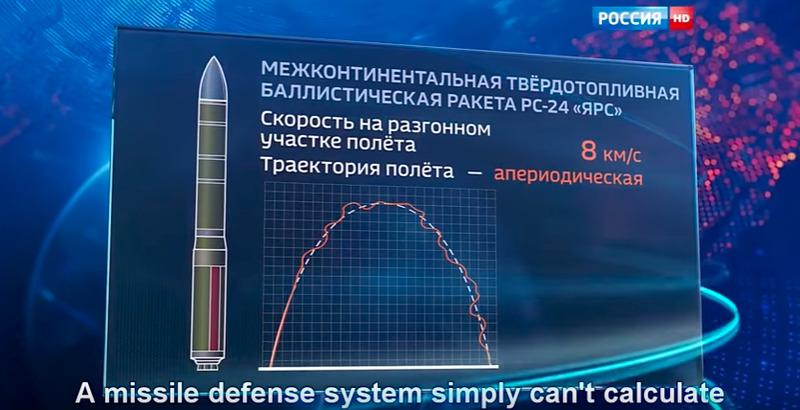 Even in test conditions, US missile defences struggle to intercept ICBMs, but the US doesn’t even stock a sufficient number of interceptors to repel a Russian attack. Russia’s ministry of defence reported that all missiles hit their targets. Russia last launched the Yars in September during a massive military drill near its border with Eastern Europe. Watch the ICBM launch below.